The use of Orthodontic treatment is often required to correct misaligned teeth in children. Many children and teenagers facing this orthodontic treatment, have concerns and questions prior to their treatment. 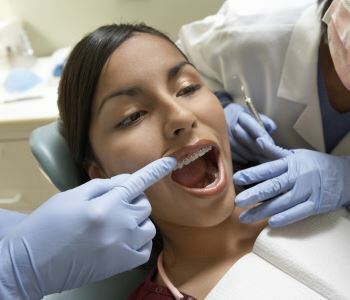 It is common to feel anxious or unsure about wearing braces. They may hear from their peers that they will have to give up the foods that they love, or that wearing braces hurts. Many children equate wearing braces to a feeling of awkwardness, or may simply feel uncomfortable. It is often reassuring for them that their dental care provider in the practice is also skilled in orthodontics. In our dental practice in Moonee Ponds and Sunbury, we offer a wealth of dental services, including orthodontic care, so that your family can have their various dental needs met in a comfortable setting with familiar, friendly faces. In addition to answering any questions that may arise before or during treatment, we suggest a few tips that will help parents guide their child through a stress-free and mostly fun orthodontic treatment. Although braces are typically seen on teenagers, an evaluation for misaligned teeth can begin years earlier. At Smile In Style we monitor children from the ages of six or seven. As we offer services in our Moonee Ponds and Sunbury practice which includes general dental care, hygiene treatments, and orthodontics; it is easy for children who regularly visit our practice to transition into this new dental phase of orthodontics. Early evaluation monitors the growth of teeth as well as the jaws. Some irregularities picked up in the primary dentition warrant early intervention. These include: anterior crossbite, posterior crossbite, unilateral crossbite, underdeveloped mandible (lower jaw) or maxilla (upper jaw), habits such as tongue thrust, thumb sucking, open bite and deep bite. When necessary, your dentist may suggest interceptive treatment to correct these discrepancies in the primary dentition. This makes future orthodontic treatment in the secondary dentition easier with shorter treatment times and better results. Braces are designed to gradually move teeth into the right position. Although gentle pressure is consistently applied through brackets and wires, mild to moderate discomfort may occur as the underlying ligament is urged to move. This can be handled initially with over the counter pain relievers. Discomfort with braces may come from the presence of metal brackets, which can contact the lips and the inside of the cheeks. Placing dental wax over brackets that pose a problem can greatly improve comfort throughout treatment. Protecting the lips from catching on brackets can be made easier by applying lip balm, which keeps the lips from becoming dry. Most patients suffer discomfort during the first week but their tissues get used to the brackets, bands and wires after this time. Braces do not have to put a damper on a teenager’s life. Even when conventional braces are the most suitable form of treatment, comfort and aesthetics can be managed. We choose to offer conventional braces using the cutting edge “POS IP Appliance” which is customised for each case, over alternative clear aligner technologies. In our experience conventional braces usually cost less and deliver better results for our patients at a cheaper price. In the end, the lifetime results speak for themselves and our patients just can’t stop smiling. It’s life changing and very rewarding dentistry. In fact we have found that many parents book in for orthodontic treatment once they see how beautiful their children’s smiles are and want to have the same for themselves. Contact us in Moonee Ponds 03 8400 4104 or Sunbury 03 8001 6021 for your appointment.